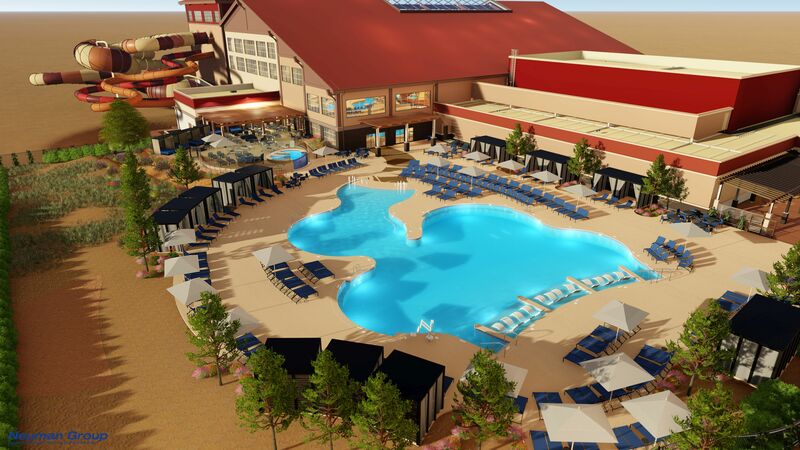 SALT RIVER PIMA-MARICOPA INDIAN COMMUNITY, AZ — Great Wolf Lodge has revealed more details on what guests can expect when the 350-room hotel and 85,000-square-foot water park opens later this fall. 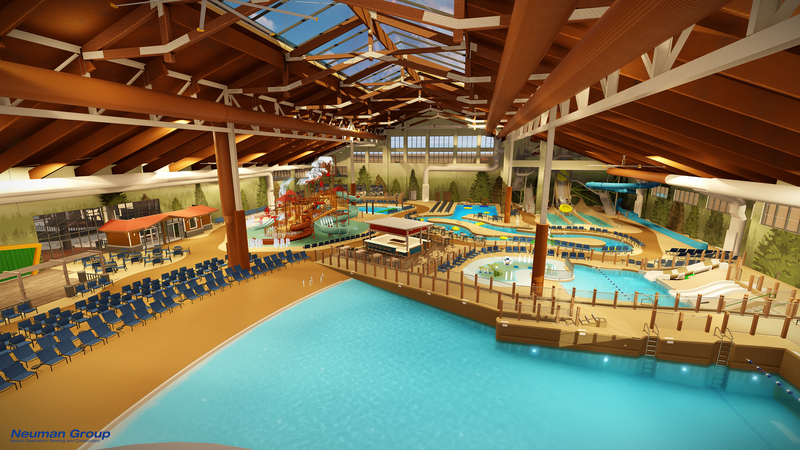 The indoor water park will have a mix of tube slides and raft rides for both the thrill-seekers and the little ones, an indoor lazy river, and a multi-level play structure with a 1,000-gallon bucket that dumps water every few minutes. Outside, there will be a resort-style pool to soak up the sun, and an adults-only area with lounge chairs and private hot tub. The resort is scheduled to open on Oct. 17, 2019, across from Salt River Fields at Talking Stick near Pima Road and Talking Stick Way on the Salt River Pima-Maricopa Indian Community. Here is what guests can expect. Talking Stick Treehouse: A multi-level water play structure with five water slides (two taller slides and three designed for toddlers), suspension bridges, spray stations, and a 1,000-gallon bucket that fills up with water and dumps it every three to four minutes. Wolf Tail: A body slide where riders step into a launch pad and wait for the floor to drop, sending them into a 20-foot free fall followed by a 360-degree, high-speed loop. Howlin' Tornado: A family-friendly water ride where people sit in a raft and go down a 15-foot drop into a large funnel and sway from side to side. Alberta Falls: A tube slide for one or two people that has chutes, drops, serpentine, and 180-degree and 360-degree banked curves. River Canyon Run: Up to four people will sit in a raft and go down one of the longest slides at the park. It does not have any steep drops so it is ideal for those looking for a less-intense slide. Slap Tail Pool: A wave pool with up to three-foot-tall waves that come every five minutes. Crooked Creek: Great Wolf Lodge's version of a lazy river. People will be able to grab a tube and float along a winding river in the middle of the water park. Chinook Cove: Childrens activity pool with basketball hoops, floating obstacles and other water features. Big Foot Pass: An obstacle course with floating lily pads and logs, and cargo nets to help you make it across. Whooping Hollow: Geared towards babies and toddlers, this play pool has water slides with "gentle slopes and tiny turns." There is also a zero-depth entry pool with a water fountain and "spray-and-play adventures." As previously announced, the resort will also have an indoor amusement park, called Great Wolf Adventure Park, with a ropes course, miniature golf, arcade games, and MagiQuest, a live-action adventure game where kids use wands to help pixies and fight dragons and goblins. They will also have complimentary programs such as morning yoga or a nightly bedtime story. It will also have two restaurants, a Ben and Jerry's ice cream parlor -- the only location in the state -- and an animated projection show in the lobby. Standard overnight rates start at $179.99, plus a resort fee, and include two days at the water park, according to a news release. People could start making reservations last month. For the grand opening, the resort was offering 30% discounts on stays booked through March 5, 2020 using the promo code, "grand." One note, trips need to be booked by May 1, 2019. They can be booked online or over the phone at 1-888-960-9653.